Shortly after the confirmation of President Bingu wa Mutharika's death early on Saturday, Malawi's Vice President Joyce Banda was sworn in as the country's — and southern Africa's — first female head of state. Banda, who'd served as vice president since 2009, was cheered by crowds during and after her oath before Malawi's parliament, and called for calm in the wake of Mutharika's death as she spoke to a gathering of journalists and public officials. The BBC reports that Mutharika went into cardiac arrest on Thursday at the age of 78. The delay in announcing his death prompted fears that members of the late President's inner circle would try to circumvent Malawi's constitution and install Mutharika's brother, Foreign Minister Peter Mutharika. 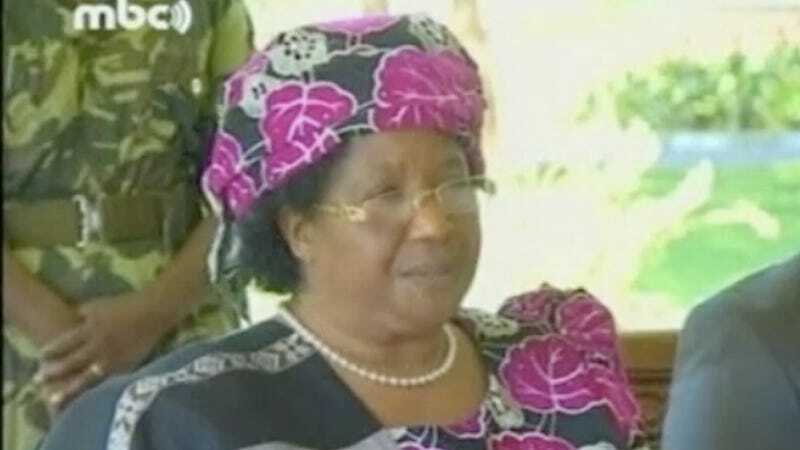 Joyce Banda had fallen out of favor with Mutharika in 2010 when she became one of the regime's harshest critics and was subsequently booted from the ruling Democratic People's Party. She went on to found the much more streamlined People's Party and resisted Mutharika's attempts to oust her from her vice presidential office. In taking the presidential oath, Banda said all the right things about unity and respecting the constitution, assuring her audience, "It is with a great sense of humility and honour that I accept the huge responsibility of that the people of Malawi have entrusted me with." She'll have quite a job ahead of her — Malawi is one of the poorest countries in the world, with an infrastructure plagued by fuel and currency shortages and 75 percent of the population living on less than a dollar a day.